Bhaktivaibhava Swami finished his studies and joined the Hare Krishna movement in 1970. The following year he was initiated by Srila Prabhupada. 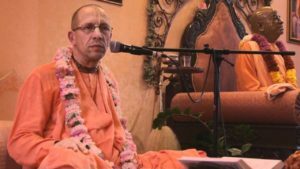 He has been an initiating spiritual master in ISKCON since 1987, and was awarded sannyasa initiation in 1991. When he joined, there was only a fledgling group of devotees in Germany and together they recruited eighty members within four years. He began the Berlin chapter of ISKCON during the 1970s, and this became a doorway to share Krishna consciousness in the communist countries. He spent time in the Soviet Union, Middle and Far East sharing Krishna consciousness with risk to his personal safety and often times in trying circumstances. He established a thriving ISKCON center in Mongolia and has been awarded an honorary degree by the local university. His responsibilities in the GBC include his role as zonal secretary for Mongolia, Albania, Bulgaria, Czech Republic, Finland, Macedonia, Poland, and Slovakia. He serves as co-zonal secretary for Eastern and Western Siberia, Latvia, Belarus, Kaliningrad CIS, Ukraine, Far East CIS and Romania. He served on the GBC executive committee from 2006-2008, first as the GBC chairman and then as a committee member. Bhaktivaibhava Swami is very interested to secure the future of the GBC in the next generation and has worked to support the strategic planning effort towards this goal. His interest in filmmaking and spreading the culture of Gaudiya Vaishnavism has resulted in two documentaries, “Mother Ganga” and “Lost Village.” Earlier in his spiritual career, he produced films on Indian culture for German audiences that helped to promote Food For Life (ISKCON’s sacred food distribution initiative).